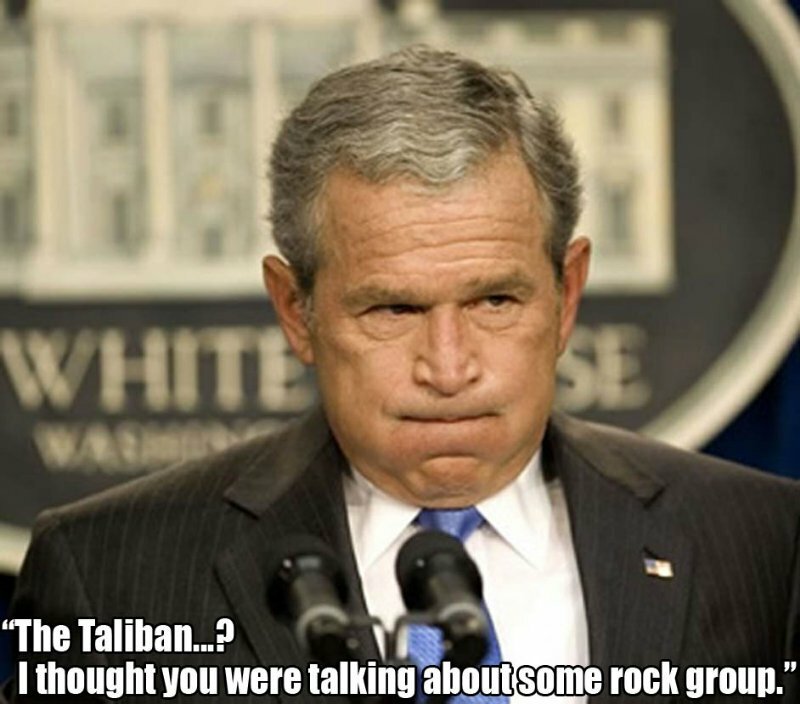 George W. Bush: May I Quote You, Mr. President? Originally published by Global Research in November 2006 at the height of GWB’s second term in the White House. Bush versus Trump: The lack of knowledge and understanding by a president of the United States can lead to unthinkable mistakes in regards to US foreign policy. #1: “International law? I better call my lawyer; he didn’t bring that up to me.” George W. Bush, December 12, 2003. #2: “We know that dictators are quick to choose aggression, while free nations strive to resolve differences in peace.“/George W.Bush’s Address to the United Nations General Assembly, September 21, 2004. #3: “...for a century and a half now, America and Japan have formed one of the great and enduring alliances of modern times. From that alliance has come an era of peace in the Pacific.“/Remark made by President George W. Bush to the Diet, Tokyo, Japan. February 18, 2002, even though the U.S. and Japan have been openly at war with each other. #4: “One of the keys to being seen as a great leader is to be seen as a commander-in-chief….My father had all this political capital built up when he drove the Iraqis out of Kuwait and he wasted it….If I have a chance to invade…, if I had that much capital, I’m not going to waste it.“/remarks made by Bush to author and Houston Chronicle journalist Mickey Herskowitz, who met GWB many times in 1999, to write a biography. #6: “Our enemies are innovative and resourceful, and so are we. 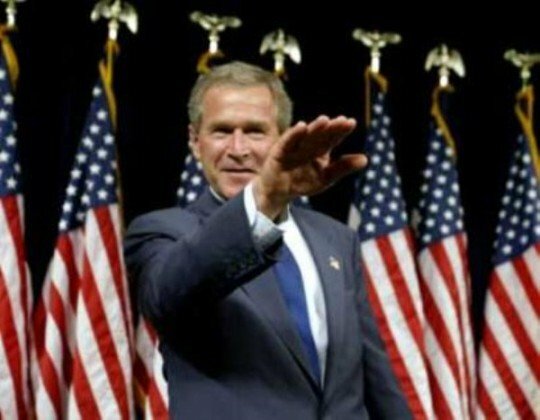 They never stop thinking about new ways to harm our country and our people, and neither do we.“/Bush’s remarks video clipped in Washington, D.C., as he signed the Defense Appropriations Act for Fiscal Year 2005, on August 5, 2004. #8: “I believe God wants me to be president” is a Bush’s statement that came during a meeting with Rev. Richard land, head of the public policy arm of the Southern Baptist Convention, in 1999. #9: [I was] “chosen by the grace of God to lead at that moment”, is a Bush’s quotation reported by Michael Duffy in Time magazine immediately after 9/11. #10: “God told me to strike at al-Qaeda and I struck them, and then he instructed me to strike at Saddam, which I did, and now I am determined to solve the problem in the Middle East. If you help me I will act, and if not, the elections will come and I will have to focus on them“ comes from a remark made by Bush to Palestinian negotiator Nabil Shaath, made to and reported by BBC News on Thursday, October 6 2005. #11:“I trust God speaks through me. Without that, I couldn’t do my job” is a Bush’s remark to a group of Amish people he met with privately on July 9, 2004, and as published by the Lancaster New Era, July 16, 2004. #13: ‘There’s an old saying in Tennessee — I know it’s in Texas, probably in Tennessee — that says, fool me once, shame on — shame on you. Fool me — you can’t get fooled again.‘ is taken from a video of Bush’s remarks in Nashville, Tennessee, September 17, 2002. #14: “Ariel Sharon … is a man of courage and a man of peace” is a quote reported by Glenn Kessler, in the Washington Post of Tuesday, June 3, 2003. #15: “See, in my line of work you got to keep repeating things over and over and over again for the truth to sink in, to kind of catapult the propaganda.” comes from remarks Bush made during a Social Security Conversation at the Athena Performing Arts Center in New York on May 24, 2005. #16: “I just want you to know that, when we talk about war, we’re really talking about peace” is taken from a Bush’s speech at the Department of Housing and Urban Development, Washington, D.C., June 18, 2002. #17: “This notion that the United States is getting ready to attack Iran is simply ridiculous. And having said that, all options are on the table” is a widely known remark that Bush made during a press conference, after a meeting with EU leaders, on February 22, 2005. #18: “Free nations don’t develop weapons of mass destruction” is taken from Bush’s speech at the Midwest Airlines Center, in Milwaukee, Wisconsin, on October 3, 2003. #19: “The most important thing is for us to find Osama bin Laden. It is our number one priority and we will not rest until we find him” was recorded at a Bush’s White House press conference in Washington, D.C., on September 13, 2001. #20: “I don’t know where bin Laden is. I have no idea and really don’t care. It’s not that important. It’s not our priority” was recorded at George W. Bush’s White House press conference in the James S. Brady Briefing Room, Washington, D.C., on March 13, 2002. #21: “We found the weapons of mass destruction. We found biological laboratories…for those who say we haven’t found the banned manufacturing devices or banned weapons, they’re wrong, we found them” is a statement Bush made in Washington, D.C., on May 29, 2003. #22: “Oh, no, we’re not going to have any casualties [in Iraq]” is a statement made by Bush during a discussion in early 2003 about the Iraq war with Christian Coalition founder Pat Robertson in Nashville, Tennessee, and as quoted by Robertson himself. #23: “Many Iraqis can hear me tonight in a translated radio broadcast, and I have a message for them: If we must begin a military campaign, it will be directed against the lawless men who rule your country and not against you” comes from the transcript of a Bush’s speech made on March 17, 2003, days before the U.S.-led invasion of Iraq. #24: “Brownie (Michael Brown of FEMA), you’re doing a heck of a job” is still fresh in everybody’s memory; it is a public statement made by Bush about Michael D. Brown, head of Fema, following Hurricane Katrina, at Mobile Regional Airport in Mobile, Alabama. on September 2, 2005. #25: “I’m also not very analytical. You know I don’t spend a lot of time thinking about myself, about why I do things” was recorded by journalists aboard Air Force One, on June 4, 2003. #26: “If this were a dictatorship, it’d be a heck of a lot easier, just so long as I’m the dictator“ is taken from an audio clip of President-elect George W. Bush, at a photo-op with congressional leaders during his first trip to Capitol Hill, Washington, D.C., Dec. 18, 2000; it was also reported on Online NewsHour, Washington, DC, December 18, 2000. #27:“I’m the commander — see, I don’t need to explain — I do not need to explain why I say things. That’s the interesting thing about being president.” can be found in Bob Woodward’s book “Bush at War”. #29: “It’s amazing I won. I was running against peace, prosperity, and incumbency” is a comment made by George W. Bush, on June 14, 2001, to Göran Persson, unaware he was still on live TV. #30: “It’s very important for folks to understand that when there’s more trade, there’s more commerce” is a Bush’s remark made during a meeting of leades of the Americas, in Quebec City, Canada, April 21, 2001. George W. Bush’s remark made to the Press-Telegram, Monday, August 21, 2006. George W. Bush’s acceptance speech at the Republic National Convention, on September 2, 2004. #45: “We feel our reliance on the Creator who made us. We place our sorrows and cares before Him, seeking God’s mercy. We ask forgiveness for our failures, seeking the renewal He can bring”. #46: “…But what if God has been holding his peace, waiting for the right man and the right nation and the right moment to act for Him and cleanse history of Evil?